Who is ready for the next stage of MadTree Brewing to begin? I know that I am and the wait is almost over as recently the following news was released by the good folks at MadTree Brewing. CINCINNATI (December 9, 2016) – MadTree Brewing announced today the date for the Grand Opening of their new state-of-the-art ‘2.0’ brewery, taproom, beer garden, and private event space. Just over a year ago, they began the project to renovate the former RockTenn building, an obsolete brownfield manufacturing facility, located at 3301 Madison Road. They will celebrate the opening of the new location at 3301 Madison Road in conjunction with their annual Winter Bonanza anniversary party on Saturday, February 11, 2017. Guests can expect a full lineup of current MadTree beers along with many fan favorites from the past. Other breweries from around the region and the country will be on-hand offering beers not usually found in this market. There will be live music plus food trucks and restaurants from the Cincinnati area on-site to keep stomachs full. Additional details about the event will be shared in the coming weeks. 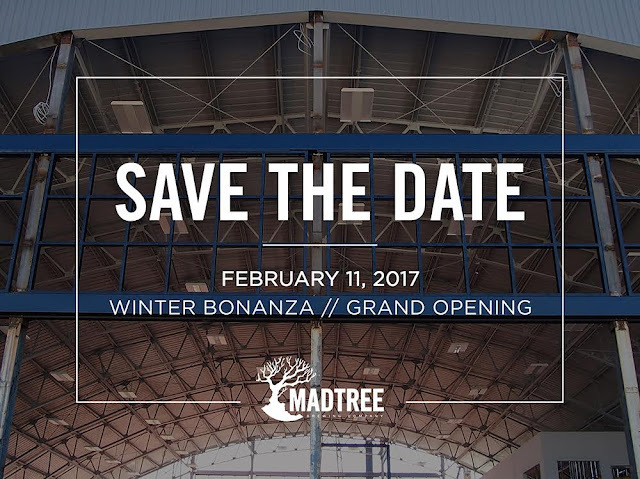 MadTree invested over $18M constructing the new complex, immediately bringing more than 50 jobs to the City of Cincinnati with plans to create 40 more jobs over the next three years. Labels: Beer Articles, Brewery, Cincinnati Beer, cincinnati brewery, MadTree Brewing Co.